If you keep bees and have never tried mead then you have missed the point of beekeeping. Mead has as many variations as wine or beer but has it’s own unique identity. Since I live in Mississippi, the only mead that seems to be imported into the state is from the oldest meadery in the country, Chaucer’s Mead. Not a highly rated mead but it comes with a spice bag that can be added to a heated batch. This warm spiced mead has now become a family tradition for the past five or six Christmas’s in our house. Since I have always had a fantasy of owning a winery, owning a meadery seems almost as romantic. Therefore I have been experimenting with home mead making for the past year or so. My first batch was okay but a little dry. So this year I harvested (8) frames of honey. 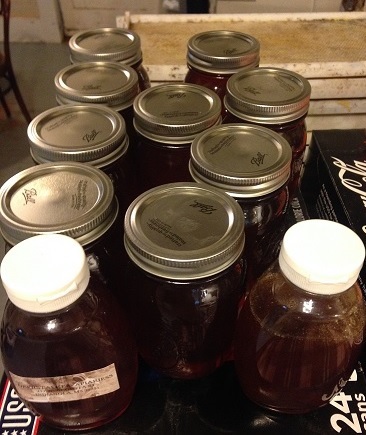 I don’t have much honey this year, as I have been focused on making splits. Just the same, I took the cappings after they had drained and I put them in a tin pan with (1) cup of water. Then I melted the wax at 200͒ F. I then let it cool and lifted the wax off the top. What was left was a dark mix of water and honey. I poured that into a measuring cup and had (1.75) cups of honey mixed with (1) cup of water. I added some fresh honey and made it an even (2) cups. Heat the honey and hot water on the stove and bring to a boil. Then remove and add cold water. I then placed the pot in a ice bath until it was cool to the touch (about 75͒ F). Then add the yeast. I placed this in a (1.5) litter wine bottle (I poured the remaining (2) cups down the sink) and placed an airlock on it. Now it is bubbling. There are a lot of recipes but this seems to be the simplest by far. I’ll let you know how it comes out in a couple of months.